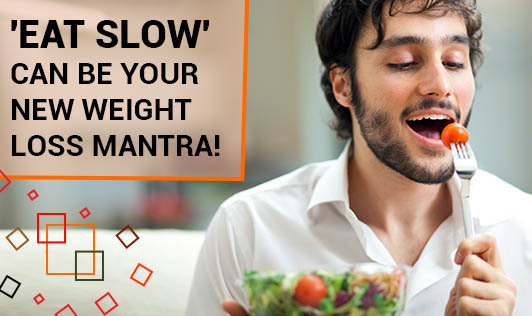 'Eat Slow'-Can Be Your New Weight Loss Mantra! A Chinese proverb says, "The more you eat-the lesser the flavor, the less you eat- more the flavor." How many of us just gobble away food when we are irresistibly hungry or eat and finish it off just because you have to eat, without even enjoying the flavors of food? I'm sure most of us haven't even given this a small thought! Basically, all this leads to unhealthy eating and unhealthy lives. The best solution for this is to ‘eat slowly'. Eating slow is simple and a very powerful act with lot of surprising benefits. It can take a few extra minutes with each meal, yet it can give profound effects. Eating slow is just not about good health, it is also about good lifestyle. If you find it difficult to adopt it as a lifestyle, you can still continue to consider it as a good habit because it has good reasons to be habit-forming! Helps losing weight: A growing number of studies show that just by eating slow, you'll consume lesser calories without doing anything different. The reason behind this is, our brain takes time to register that our stomach is full. When we are eating fast we tend to eat more even before we realize that we are full. So it is highly recommended that you chew your food enough and eat slow and be sure the food you are eating is healthy. Enjoy and relish your food: It is hard to enjoy food if it goes down quickly, and at the same time you'll be guilty about those extra calories that just went down your throat! So, it is fine if you are eating those sinful foods occasionally in small quantities with the new mantra ‘eat slow'. Initiate better Digestion: When you are eating slow, you actually chew your food well and initiate the digestion process more effectively. This can even work out as a solution to most of your digestion problem. Reduce stress: Paying attention to what you eat and relishing all those flavors in the food can be a very mindful activity. Be in the mument and enjoy your meal rather than planning up your to-do-list for the day. Say no to fast foods and ready to eat foods: Our stressful, fast paced and hectic lifestyle leads us to look for easy options like fast foods and ready to eat foods. This takes us to an inactive and unhealthy lifestyle. Rather than rushing ourselves through mindless work and eating, we need to take out little time to enjoy and relish life! !